On Thursday, October 18, 2018 the Board of Directors of the Old Town School of Folk Music voted to put its building at 909 W. Armitage -- the School’s historic home, where classes have been held for 50 years -- on the market. After massive outcry from the community -- students, staff, faculty, neighbors and others -- the Board voted to put the sale on hold until March 31, 2019 to create time for feedback from the larger School community of teachers, students, staff and others. You can find a detailed timeline here and news stories about it here . Bau Graves said everything in the petition was false. What’s up with that? We believe the petition is accurate. No one from the School or the Board of Directors has challenged any of the specific assertions in the petition. If there are inaccuracies, we hope they will be pointed out so we can correct them. Can I still take classes at 909 W. Armitage? You can -- and we hope you do. Low class enrollments will provide more ammunition for those who want to sell the building. The original plan announced in October 2018 was to have the sale of the building close in the summer of 2019, and the School has committed top holding off on marketing the building until at least the end of March 2019. There are classes listed for January 2019, and we expect classes to be offered for Session 2 (March/April) and Session 3 (May/June). If you’d like to take classes, use one of our discount codes for $15 off for the January 2019 session: OTSFRIENDS19 and WIGGLEFRIENDS19. Get more information here. Why should I care about selling the old building? The second reason is that the building itself has been the beating heart of the OTSFM community for the last 50 years, as well as an important and consistent vehicle for community connection within the neighborhood around it. “Still wondering what all the fuss is about? This is Armitage Ave. It's vibrant, validating, and vital to the historically storied community it serves. At a time when Americans are searching wildly for a way to reconnect with one another, Armitage stands as an unacknowledged monument to Chicago's citizenry, its diversity, its trials and tribulations. It is a place where histories converge. The sale, or potential sale of this paragon of musical spirit and fellowship deserves more attention not only because of the way it will impact the admins, musicians, desk and building maintenance staff that work there, but because the financial return on the sale of this property pales in comparison to its import to the Chicago Community at large. It is a nostalgic haven for locals and tourists alike. As important, if not more so, than the Rock n' Roll Hall of Fame, Nashville, Passim's, Joshua Tree, and Red Rock. See also this article from the Chicago Tribune: Commentary: The 'magic' at Old Town School's Armitage building. 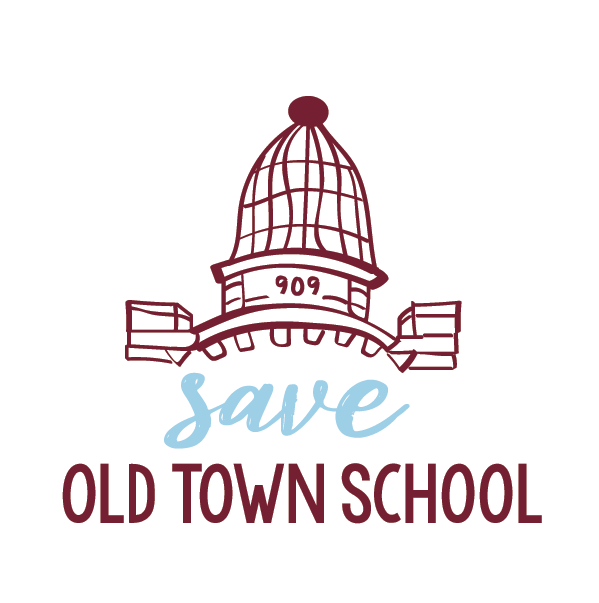 Why do you call yourself “Save Old Town School” if only one building is proposed to be sold? Our name "Save Old Town School" conveys several messages: first, that 909 W. Armitage is critically important to our community; second, that rebuilding student enrollment is essential to preserve the School; and third, that we need to come together as a community to discuss and solve the School’s problems. You might think of “Save Old Town School” as an intervention -- like friends and family coming together to help a loved one who has been making poor choices to turn their life around. Why does the School want to sell 909 W. Armitage? The stated reason is to to create an endowment -- to invest the proceeds from the sale and provide a steady stream of income to support the School’s operations independent of enrollment or donations. School officials have also said that the building is underutilized. The School has stated a goal of building a $10 million endowment, but the best available estimates suggest that the sale of the building would bring $2 million to $4 million. The administration and Board have not provided any information about how the remaining endowment money would be raised -- nor have they explained how selling Armitage would make it easier to get donations. In fact, we suspect that many of the most promising successful donors would be highly likely to have an attachment to 909. Is the School in financial trouble? The financial health of the School is steadily declining, but it does not appear to be in imminent danger. As of December 31, 2017, the School had $2.8M of cash, no debt (the bond related to the East Building at Lincoln Square was paid off in 2015), and an endowment of $356k. The School spokespeople are careful to say that it is not in debt. The operating surplus and net income have been declining. In 2017, the School reported a net loss of $730k. When non-cash (depreciation and amortization) and non-recurring (bad debt accrual) are added back, the operating cash flow was around breakeven. This compares to nearly $600k of net income and $1.4M of operating cash flow in 2015. However, and especially in light of steadily declining enrollments over the last seven years, their recent actions suggest that the Board believes that if something drastic isn’t done soon, the School will be in trouble. Whatever the cause of the decline, we think the administration and Board should be transparent about what the financial situation really is so that we can all work towards a stronger Old Town School of Folk Music together! Nonprofit organizations sometimes create endowment funds to provide an ongoing, reliable stream of income to the organization. Usually the endowment is structured so that the principal amount is invested and only the investment income is available for use. The School has announced its intention to raise a $10 million endowment in the “short term” by seeding it with proceeds from the sale of 909 W. Armitage and presumably raising the balance from individual donations. To put things in perspective, a $10 million endowment with a 4 percent annual rate of return on investment would generate annual earnings of $400,000 for the School. That represents about 3 percent of the School’s current $13 million budget, not enough to change the financial picture dramatically. School staff have suggested that they expect the Armitage building could sell for as much as $4 million. If that happens, the School would need to raise an additional $6 million to reach the $10 million stated goal. Without the additional funds, a $4 million endowment with a 4 percent annual return on investment would bring in $160,000 a year for the school, less than 1.5% of the School’s annual budget. Not to put too fine a point on it, but that's not even enough to pay the present executive director's salary. How do you create an endowment fund? Usually endowment campaigns or other types of large-scale fundraising campaigns begin with a “quiet phase” during which several lead donors are sought who will pledge to make substantial gifts, usually enough to collectively reach half of the campaign goal. At that point, the campaign is announced to the public, and the lead donors serve as a source of motivation and inspiration for other donors to step up and make their own significant gifts. In effect, these lead donors demonstrate through their actions that they believe so strongly in the nonprofit organization that they are willing to “dig deep” and make much larger gifts than they usually do on an annual basis. Seeding an endowment campaign by selling a hard asset such as a building is very unusual, even when the sale has not generated any controversy. And in fact, selling 909 W. Armitage in order to start an endowment fund isn't necessary at all. Importantly, the School has not announced any lead donors for their desired endowment fund. Without such donors to lead by example, one wonders how they plan to motivate their constituents to “dig deep” and contribute to a multi-million dollar endowment. Does the school have a sound strategy for raising the $6 million needed to get them to their stated “short-term” goal of $10 million? If so, why not just implement the strategy and start by raising the $6 million? Selling a building, especially one that has such deep and historic significance to the organization, does nothing to engage and cultivate donors. Furthermore, sale of the 909 W. Armitage building may cause many long-time supporters to drop away, making it even more difficult to meet endowment goals and potentially threatening the long term survival of the organization. The decision announced Dec. 3 to pause the sale may help mitigate the supporter alienation that the October 22nd announcement created, but the controversy over the proposed sale and the lack of communication about it could have long-lasting effects. What’s the status of the building sale? In October, the Board of Directors voted to list the building for sale, according to the press release with Cushman & Wakefield. In early December they voted to put the sale on hold until at least the end of March. What are the student and enrollment trends? The number of students and enrollments have been declining since 2011. According to the School’s published financial statements and IRS filings, total enrollment (combining group classes, private lessons, workshops and summer camp), was down 22 percent, from 44,090 in 2011 to 35,383 in 2017. Enrollment in group classes, the largest component, was down 28 percent; private lessons, down 7 percent. The latest information the School has provided indicates that the School has about 15,000 individual students, down from more than 17,000 in 2011. For the Armitage location, a School spokesperson was quoted as saying enrollment was down “closer to 30 percent” over the past 5 years. Does anyone know why enrollment is declining? Publicly, in recent years the administration has blamed external factors like the increased availability of "free" online instruction through YouTube, and decreased interest in guitar-driven music for the steady decreases in enrollment. But we don't think that's what's going on. We don't have the information that Old Town School of Folk Music has, or should have, about its students and enrollment, so while we can speculate about things like increased class prices, reduced morale, removal of low- or no-cost community-strengthening activities, and fewer course offerings, we haven’t been able to do any kind of complete analysis to fully understand the decline. Likely it is some combination of many factors, big and small. We do know that they could be doing much a better job of marketing and of using the community to help recruit and retain students. They also eliminated things like the First Friday open house in Lincoln Square and printed course catalogs, which we think also contributed to the decline. How long have children’s classes been losing enrollment? Has the removal of the discount been contributing to that? Can they think about adding back discounts for families? If enrollment is down, does it make sense to eliminate classes at 909 W. Armitage by selling the building and using the proceeds to strengthen the School? We don’t think so. First, we believe enrollment can be turned around through savvy digital marketing, experimentation with class pricing and a renewed commitment to building community among students, faculty and staff. We also believe the School’s leadership has helped cause the enrollment decline by raising class prices and taking actions -- such as eliminating the monthly First Friday open house in Lincoln Square -- that have damaged the School’s sense of community and diminished the student experience. Additionally, the allegedly steeper decline in enrollment at 909 W. Armitage is partially attributable to the limited selection of classes the administration has chosen to offer there. Years of deferred maintenance haven't helped, either. Furthermore, if the 909 W. Armitage building is closed, it will make the enrollment problem worse as there are students who are taking classes there who will not be willing to travel to Lincoln Square, and closure of the location will reduce the overall offerings of the School. Finally, as noted above, an endowment funded through the sale of 909 W. Armitage would not produce enough money to meaningfully address the School’s financial challenges. A plan to reverse the declining student enrollment would be needed even if 909 W. Armitage is sold -- and there is no evidence that the School’s current leadership knows how to do this. What is the board doing in regards to marketing? What is their vision? Do they have plans to rethink and provide more outreach? Who are we marketing to? Where are the younger people? Where are the people of color? What is being done to engage people with diverse backgrounds? What about senior citizens who could come during the day when the building is empty? The profile of students at the school is not as diverse as any of us would like to see. The current administration has made efforts to reach out to other neighborhoods and communities, which we appreciate. We suspect that diversifying the student body will require a combination of new kinds of classes and targeted marketing initiatives. What is the representation of the kids in the pre-teen and teen years? How can we get them to be a part of the movement? See info above under “enrollment” for children and teens. Combined, they currently represent about 27% of all students; there are about twice as many adults as there are children and teens. We are forming committee to try to think of ways to reach these younger people, and welcome volunteers. Can the school be rebranded? Change the name? How do we call more attention to it? We think that more information is needed before we think about rebranding or changing the name of the school, and we would not recommend taking this step blindly. On a broad scale, we would like to see the school making smart decisions based on accurate market research. That being said, we love how the name of the school and how it ties into the history and culture of our community. Also, "Old Town School of Folk Music" has a lot of name recognition and goodwill associated with it. A related question might be, can the school's image be updated and refined so that potential students and concert-goers will better understand the wide variety of offerings? We think that it can. What are the efforts in getting the major donors of the Old Town Board involved in these efforts? We have talked with a number of donors and solicited letters from them to the Board. A SOTS donor outreach committee or subcommittee is being formed; volunteers for this committee will be welcomed. What’s going to happen to the teachers and staff if the building is sold? The School would presumably try to move some classes and private lessons to Lincoln Square, and the administration has said they would continue to offer Wiggleworms classes in a different space in Lincoln Park. But there would almost certainly be fewer class slots for teachers, so some would lose classes and pay. Some staff members would likely lose their jobs or have their hours cut. For some teachers, a loss of hours could translate not only a loss of income but also forfeiting eligibility for health insurance benefits. This is awful for us, the students and larger community. But for the teachers and staff, this is their livelihood. Any word from the Board about protection for the teaching staff? Any word from them on the "voluntary severance" (buyouts)? We are disappointed that the school is planning to close its music store on Armitage in January 2019 and is continuing with its plans for a "voluntary buyout package" for administrative staff. We continue to believe that the decline in student enrollment that is driving these expense reductions can be turned around with sufficient attention to marketing and pricing strategies. We hope any other cost-cutting initiatives will be limited and temporary, and will not include staff layoffs. In our remarks to the board on November 29th we said the following: “[We] hope you understand the anguish we feel -- for ourselves and for our friends on the faculty and staff -- when they fear for their livelihoods and, in the case of staff, have been threatened with layoffs. Why are they issuing voluntary severance? There's been no official statement, but we understand that the letter that was sent out to the staff said that it was due to "budget challenges." We are told that the recipients of the letter were given until November 30th to decide whether to apply for the severance package. What is happening with the teaching staff? Is SOTS stepping on the toes of people who work? The teaching staff is not being offered voluntary severance. We understand that most are paid an hourly rate based on the classes/lessons they teach, and if they teach a certain minimum number of hours they are eligible for health insurance benefits. However, as enrollment goes down, or if students don't follow them to a new location, then they don't have classes to teach and their income goes down. Some may lose classes/lessons to the point that they not only lose income, but they lose insurance. We believe that a rising tide lifts all boats. The key is to rebuild enrollment. We want to provide feedback from the perspective of students, and, where needed, boots on the ground to help classes fill and run through recruiting new students, mentoring beginners to increase retention, etc. We don’t want to replace existing employees; we want to support staff and teachers in any way we can, and we can only be effective if management is effective in utilizing us to complement (not replace) the paid staff. I’ve been a Member at Old Town School of Folk Music for years and I’m upset about this. How can I vote the Board of Directors out? You can’t. OTSFM doesn’t have “members” in the sense referred to in the Illinois Non-Profit Corporation Act. Being a “member” at OTSFM is just a fancy way of saying you’ve donated money and so you get certain benefits, like class discounts, but it doesn’t give you any voting rights. You can take a look at the bylaws for yourself here. How are bylaws written or amended in non-profit orgs? What kind of pressure needs to be applied to amend the bylaws? The initial bylaws of an nonprofit corporation are adopted by the corporation’s board of directors as part of the organization of the nonprofit. Thereafter the board of directors has the sole power to alter, amend, or repeal the bylaws or adopt new bylaws. Old Town School of Folk Music is a non-member organization, and accordingly, only directors have the role and obligation to review and approve amendments to the bylaws. The current bylaws have been amended at least 12 times. We don’t currently have access to previous versions of the bylaws, but we are exploring avenues to obtain them. Nonprofits are required to report each year on IRS 990s as to whether the governing documents have been substantially changed in that year, and the school has consistently answered “no” to this question. As part of our efforts, SOTS would like to hear what amendments to the bylaws the community would like to see. The school is structurally an insular body, but we hope with under the pressure and scrutiny of the community, the Board of Directors would create mechanisms for broader participation and input in policy and decision making. These changes could include amendments to the bylaws. Can we have a report of the by-laws? What do they say about how people become members of the board? A copy of the Old Town School of Folk Music bylaws and articles of incorporation have been posted on this website at https://saveoldtownschool.org/reference-info/. The bylaws specify that candidates for open Director positions are identified, evaluated and recommended by a Nominating and Governance Committee, which consists of at least five Directors, including the Chairperson of the Board. All the members of that Committee must be current Board members. We have been told that Directors are expected to donate -- or raise -- a minimum of $8,000 per year. While Directors do much more, fundraising appears to be a key obligation of a director to the School and the “give or get” requirement is a key obligation for one to remain as a director. Only Directors can vote to add (or remove) Directors. The Bylaws provide that the Board shall comprised of at least 32 directors. Directors can only be removed by a majority of current Directors “then in office” voting at a meeting of the Board of Directors at which a quorum is present. For example, with a Board of 32, removal would require the vote of at least 17 directors. The Bylaws are somewhat confusing on the voting requirements to remove a director. A majority of current Directors “then in office” would always be greater than the number of directors needed to to establish a meeting quorum. A quorum is one-third of the “whole” Board of Directors. As a general rule, the bylaws provide that “[t]he act of a majority of the Directors present at a meeting at which quorum is present shall be the act of the Board of Directors.” Accordingly, with a Board of 32, a quorum is at least 11 directors. With 11 directors present at a duly-called meeting, the affirmative vote of only 6 would be required to for the Board to act. Currently only 29 Directors are listed on the school website. The bylaws provide for a board of 32 Directors. Vacancies on the Board may be filled by the Board at any regular meeting, and accordingly, questioning any action of the Board based on these vacancies seems unlikely to be an effective method to promote change. The members of the board have fiduciary responsibilities and should be addressing the financial decline of the school. Do we have copies of minutes of the Board? What has been discussed at Director meetings regarding the financial situation of the school? We have not seen or been provided with minutes of the Board. We have had access to public filings of financial information which paints part of the picture regarding the school’s current situation. To see these disclosures through 2017 visit: https://saveoldtownschool.org/reference-info/. Who are the voting members of the corporation? There are no voting members or voter shares in the organization; according to the bylaws, there are no members at all (from a legal perspective). Since the Old Town School of Folk Music is organized as a nonmember nonprofit, only the Directors (board members) vote on decisions. This is a legal form of nonprofit organization. Do they have to pay high property taxes on the building? Nope. The School is a non-profit, it doesn't pay property taxes. There's no mortgage or other debt on the building either. Does the 909 W. Armitage building have historic landmark status? It is not a landmark building but it is in a historic district. The building is rated orange by the Commission of Chicago Landmarks. The orange rating means that if a demolition permit is applied for, the permit will briefly be put on hold to allow time for interested parties to study the property's historic significance. During that time interested parties could pursue getting the building landmarked. The property's B3-2 zoning allows for a maximum floor area ratio of 2.2:1 meaning that a building containing 2.2 times the land area or 10,868 SF (4,940 SF of land x 2.2 = 10,868 SF) could be built on the property. This does not include lower level area which is generally not counted in the max floor area. The building currently contains around 8,800 SF of above grade area, meaning someone could add some building area. Given the property's potential historic nature, current zoning and its relatively small site size, it probably is not a teardown and is more likely an adaptive reuse, meaning someone would buy it to reuse the existing building. The most likely uses would be conversion to mixed-use, retail on the first floor and residential above or exclusive retail use. In both cases, significant capital is going to be spent in renovating the building. Why doesn’t 909 W. Armitage have a liquor license or a license to hold ticketed performances? At the town hall meeting in November 2018, a former administrator of the school recalled that once the Hild building (Lincoln Square west building) was up and running, those licenses were given up. At the time it was thought that 909 W. Armitage would be used only for Wiggleworms and teen programming. The administrator explained that it wasn't anticipated that there would be a need for those licenses in the future. Presumably this was a cost-saving measure, a liquor license currently is $4,400, and also requires special insurance. Unfortunately, once given up these licenses aren't easy to reinstate, with the liquor license possibly being more difficult. A liquor license likely would also require upgrades to the bar area to comply with current health department regulations. However, existing licensing does permit donation-optional concerts to be held at 909 W. Armitage such as Teen Open Mic, similar to the way the World Music Wednesday concerts work at Lincoln Square. If the Armitage school skews younger in age, why are they closing it if they want to reach out to the younger people? That is one of many things about the decision that we would like to have explained. What’s going to happen to my class if the building is sold? The School administration says that they are going to move some of the classes to Lincoln Square, and that they are looking for “partners” in Lincoln Park to provide space for some of the Wiggleworms classes. This isn’t just the classes at 909 W. Armitage. It is possible that some classes at Lincoln Square will be cut to make room for larger/more profitable classes that are being moved from 909 W. Armitage. Also, available rooms for practice, warm-ups, and makeup lessons may be limited.